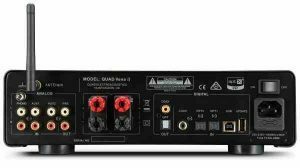 Some years back, the Quad Vena integrated amplifier arrived on the scene as one of the more well featured audiophile quality amplifiers in the $700 price range. It included Bluetooth and USB, optical and coaxial inputs. It consequently received some fine reviews both here in America and abroad. As more pressure has been put on manufacturers to cater for the so called “vinyl revival” by including built-in phono stages, Quad has included this as such in this new model. The new successor to the Vena will now, fittingly be named, the Vena II, which will now have a MM phono input onboard, in addition to DSD (up to DSD256) and expanded PCM (up to 32-bit/384kHz) file support and numerous internal developments. The new unit keeps the Class AB-type power amp but features an nicely upgraded power supply. The Vena II will also have on board the Sabre32 Reference ES9018K2M DAC which introduces ESS Technology’s 32-bit HyperStream architecture and Time Domain Jitter Eliminator technologies, and Quad says op-amps in the post-DAC active filter’s circuitry have been specifically chosen for their synergy with the DAC. The Vena II now incorporates a dedicated headphone amp, too, which should improve the sound quality you get through your preferred cans. In addition to four digital inputs (two optical, one coaxial and one asynchronous USB), three S/PDIF sockets (one coaxial and two optical) and three RCA inputs (two line-level, one MM phono), there are single optical and digital outputs, as well as pre-outs for adding an external power amplifier. The 31cm-wide chassis is familiarly characterized by a row of source-selection buttons and a large volume control, and is available as standard in ‘Lancaster Grey’ or in premium ‘Sapele Mahogany’, ‘Gloss Black’ or ‘Gloss White’ finishes.